There has never been a time when the role of the Occupational Health Physiotherapist in the workplace has been so vital. 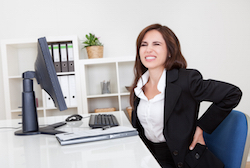 Worker's musculoskeletal disorders account for 49% of sickness absence. With over 9 million work days lost each year in Britain as a result of musculoskeletal injuries amounting to over £550 million costs to their employers, physiotherapists are extremely well placed to provide a vital role in supporting employees and employers. Modern day workplaces can be stressful and demanding with Health and Safety in the workplace of paramount importance. At ProPhysio our team of Physiotherapists with workplace ergonomic assessment skills are well placed to fulfil this role. We adopt a Bio-psychosocial approach to healthcare and understand that the individual’s background and perception of their musculoskeletal conditions has a strong influence on their success in injury recovery. We believe that work is good for physical health, mental health and well-being. There is a growing recognition that sickness is best tackled by services that are more proactive in promoting healthy lifestyles, preventing illness and early intervention. Physiotherapists already follow this model by working at every stage of the care system, from offering preventative advice to providing therapy and rehabilitation and empowering individuals to maintain their own health afterwards. ProPhysio has been actively involved in providing in house Occupational Health Physiotherapy services to a number of local East Midland employers over recent years including Meggitt, a large Shepshed based company employing over 5550 staff, and previously, G.E. Sensing in Leicester and Citi Bank (formerly Egg.com) in Derby. Rapid physiotherapy intervention at the place of work with clinicians who understand and have direct access to workplace environments. Reduced travel times to clinics off site with less time away from work. Close monitoring of treatment and efficiency. Close liaison with other Occupational Health professionals and managers. Improved employee loyalty and positive regard. We at ProPhysio can offer tailor made packages to companies large and small throughout the East Midlands. With our site ideally situated in Ashby de la Zouch we are well placed to provide a local service to companies in the surrounding area. Alternatively we can accommodate larger organisations who may require an onsite physiotherapy service. Contact us to find out more about ProPhysio at work. I really feel I am receiving a personal, tailored and highly professional service. I had a positive and realistic assessment of my injury and recovery plan. The journey is on-going but I am full of optimism. Thank you.